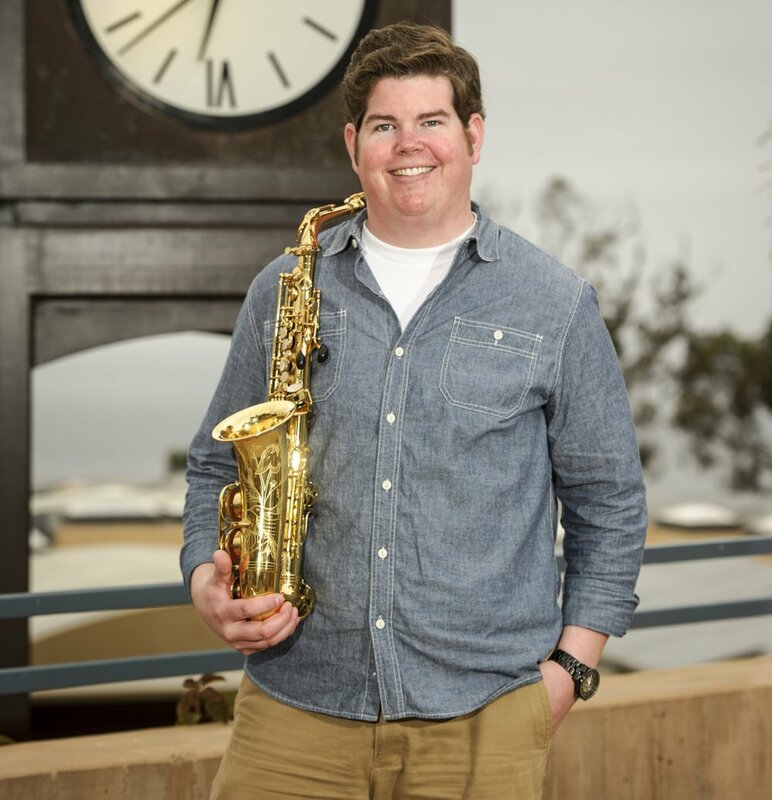 Born in San Diego, saxophonist Tyler Richardson attended San Diego State University where he earned his Bachelor’s Degree in Saxophone Performance in 2006. In 2008, Tyler completed his Master’s Degree in Jazz Studies from San Diego State University. Tyler has studied with saxophonists: Lee Elderton, Jay Easton, Douglas Masek, Todd Rewoldt, John Rekevics and Christopher Hollyday. Tyler has been performing professionally throughout San Diego for 10 years. He has performed in several different Big Bands with renowned artists: Eric Marienthal, Bernie Dresel, Gilbert Castellanos and Charles McPherson. Tyler has worked with the San Diego Musical Theatre, Lamb’s Players Theatre, and Moonlight Stage Productions performing in several musicals at the Moonlight Amphitheatre in Vista and the Lyceum in Downtown San Diego. Tyler has performed in the musicals: “Ain’t Misbehavin’: The Fats Waller Show,” “Cabaret,” “Dream Girls,” “American Rhythm,” “Annie” and “Guys and Dolls.” Tyler currently performs with the Ira B. Liss Big Band Jazz Machine and the Jazz Project Big Band. Along with performing Tyler maintains a private teaching studio for students of saxophone, clarinet, flute and piano. Originally from New Jersey, Malcom Jones has spent most of his life in San Diego. Picking up his first saxophone at the age of 10, Malcom slowly refined his skills throughout the years, performing in school bands, university band, churches and festivals. Since then, Malcom has performed in a variety of local bands, theatre productions and community groups in San Diego. Primarily an alto saxophonist, Malcom also plays tenor sax, flute and clarinet. Trained as a jazz musician, he performs a wide variety of styles and genres including funk, rock, folk and contemporary pop. Malcom holds a Bachelors of Music in Jazz Studies from San Diego State University. David has been playing music professionally for over 20 years in San Diego. Beside his work in the BBJM David also currently plays with several groups in San Diego and Orange County including Robin Henkel, The Jazz Project, Blue Largo, The Baytown Band, and others. David has also worked with groups backing the Temptations, Four Tops, Brian Wilson, Shirley Jones, Bobby Caldwell, Peter Marshall, and others. David is also an accomplished pianist and holds the position of staff accompanist at Southwestern College. He also accompanies for the Germania Choir of San Diego. 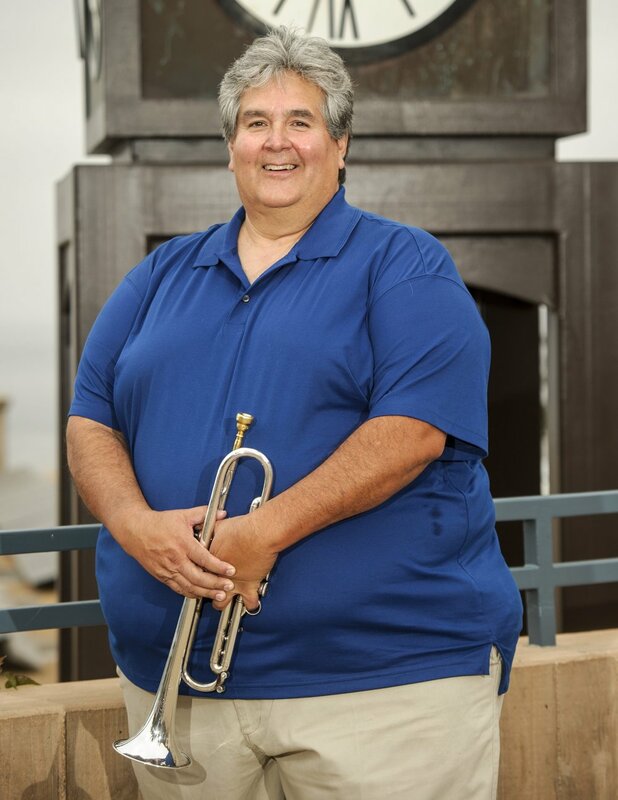 David holds a Bachelor of Arts Degree in Music Education from San Diego State University and maintains a busy teaching studio instructing on piano, saxophone, clarinet, and flute. Greg Armstrong is comfortable in virtually any performance situation. He has appeared with the internationally acclaimed Sonora Quartet, with the Tucson and Albuquerque Symphony Orchestras, and in numerous theatre, radio, television, and film productions. Greg earned his Bachelors degree in Jazz Studies and Masters degrees in Saxophone Performance from the University of Arizona where he studied with Elizabeth Zinn Ervin, Kelland Thomas, and jazz professor Jeffrey Haskell. Greg is a valued adjudicator at festivals and competitions, and provides workshops and clinics throughout the Southwest. In 2009 Greg relocated to San Diego. sounds of her baritone sax. April received her Masters in music from Azusa Pacific University. Throughout the years April has performed with many groups & artists locally & internationally including The Saxations (all girl sax quartet! ), GruvMatic, The Special Edition Orchestra, Big Time Operator, The San Diego Symphony & Opera, California Chamber Orchestra, Blast!, JAMB (bass clarinet quartet), Michael Bolton, Manny Cepeda Orchestra, Grossmont Afro-Cuban Band, San Diego Winds, Summer Winds, Left Coast Quintet & numerous theatrical productions throughout San Diego County. When April is not performing she is teaching clarinet at Mount Carmel High School as a coach and private clarinet instructor. April is a proud artist representative for Sax Dakota. She absolutely loves her Sax Dakota Raw Bronze bari! Gary Bucher was born and raised in New Holland Pennsylvania. His foray into the world of music began at age 10. He excelled at playing Euphonium and Trombone thru high school. After high school Gary joined the US Navy and attended the Naval School of Music. He began a 20 year career as a Navy Musician with duty stations in Orlando, Memphis, Guam and San Diego where he retired from the Navy as a petty officer, 1st class in 1996. Gary has performed all over the US, Southeast Asia, Australia, Japan and Africa. He has shared the stage with such notable musicians as Stan Mark, Bernie Dresel, Bill Acosta, Shirley Jones, Eric Marienthal, Dean Brown, Gilbert Castellanos, just to name but a few. Currently Gary enjoys spending the daytime hours with the United States Postal Service as a letter carrier in La Mesa CA and at night playing in a variety of bands and combos in the San Diego area. David Barnard is a veteran of Las Vegas shows and traveling horn sections of the 70’s and 80’s. Performing credits include Kurt Elling, Sammy Davis Jr., Frank Sinatra, The Lettermen, Spiral Starecase, Steve Miller, Gerald Wilson, and David Baker, among others. When he’s not playing trombone, Mr. Barnard works as a securities analyst, business consultant, dog rescue advocate, and aspiring screenwriter and TV producer. He holds both a Bachelor’s in Jazz Studies and an MBA in finance from Indiana University. Carley started playing piano when she was 5 years old, and came from a very musical family. In the 5th grade, she chose the trombone, and played in band all the way through Jr. High and High School. She attended the University of Kansas on trombone scholarship, and while there, played and sang in a variety of musical ensembles, including the symphonic band, jazz band, marching band, basketball band, trombone choir, gospel choir, and the jazz singers. Carley received my degree in Music Composition, and then moved to San Diego. She was the lead singer and trombonist for several years in a rock band that played at various venues in the San Diego area, and recorded a CD with the group. She has been singing for about 17 years in an a cappella group called Singchronicity, sings at various events around San Diego County. 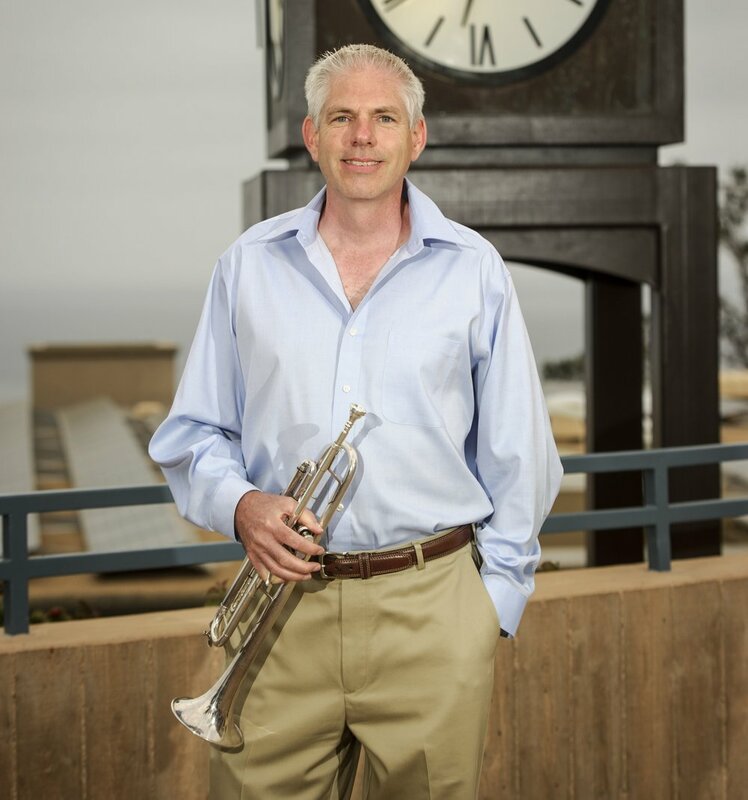 Bass Trombonist, Tim Hall, a native of Coronado, California, joined the BBJM in 1991. He is co-leader of the San Diego Concert Jazz Band and has been that band’s bass trombonist since its formation in 1976. Tim has worked with such greats as Chubby Jackson, Bobby Shew, Sammy Nestico, Shorty Rogers and Rich Mattison and has performed at The Montreux and North Sea Jazz Festivals. He has served as pianist for East Hills Christian Fellowship since 1997, and enjoys writing arrangements for trombone choirs. By day, Tim is a senior director of a major marketing firm serving the automotive industry. Randy Aviles, born and bred in Los Angeles started playing at age 6 and has made playing his horn a passion instead of a career. He says he’s thankful to God for “loaning” him the talent to play at this level. His music career spans the decades performing with such great artists as The Temptations, Louie Bellson, Rita Moreno, Bill Watrous, Wayne Bergeron, Elvis Live, Ricky Ricardo, Jr., Eric Marienthal, Bernie Dresel, Mickey Rooney, The Nosotros Golden Eagle Awards Show just to name a few. Randy’s day gig is being owner of a trucking company and long haul truck driver as well. Jack Houghton is a native of San Diego and a veteran of many musical venues. Mambo Orchestra, and the La Jolla Playhouse. The Spinners, The Four Tops, and Barry Manilow to name a few. Jack is also a Software Engineer when he is not blowing air through a pipe! Steve Sibley is a jazz pianist who has played with every imaginable type of group and appeared at literally hundreds of music venues in and around Southern California and Nevada for the last forty years. He has backed up singers such as Billy Eckstine, Reba McEntire and Bobby Caldwell, to comedy acts like Jay Leno and Robert Klein. He is a music educator and composer. Dr. Lance Jeppesen, a California native, has been playing bass since his early teens. Lance briefly attended Utah State University on a music scholarship but left to the calling of a good road gig. He has played many different genres of music since then and has traveled extensively in his music career throughout North America, before settling in San Diego. He has shared venues with the likes of Shirley Jones, Shelly Berman, Bernie Dresel, Dean Brown, Eric Marienthal, Bill Acosta to name but a few. He credits his influences being that of Stanley Clarke and Jaco Pastorius as changing his approach towards the bass and as well as music in general. By day, Lance manages a multidisciplinary medical office and practices chiropractic with his wife Jill-Ellen. He has been the bassist in The Ira B. Liss Big Band Jazz Machine since the late 1980’s.